Democratic governor hopeful and billionaire J.B. Pritzker arrived on a big bus at 5847 W. Chicago Ave. the Saturday afternoon of Labor Day weekend with his running mate, state Rep. Juliana Stratton, to open their West Side field office, where he addressed dozens of civic leaders and residents who came to show their support. The West Side was one of the 22 stops Pritzker and Stratton made during a six-day bus tour across the state earlier this month as part of their campaign to win the Democratic nomination in March 2018 to challenge incumbent Republican Gov. Bruce Rauner. “It is time for stability in this state, to give the state back to working families and people who are striving to get to the middle class,” Pritzker said. The West Side office was one of the three opened earlier this month; the other two are located in Belleville and Peoria. “There’s no campaign that’s opened as many offices as we are gonna open in this campaign,” Pritzker said, adding the West Side office will be “a forward front line” to get votes out in the spring 2018 primary and the November 2018 general election. Pritzker’s campaign is getting support from a number of West Side elected officials, including longtime Ald. Emma Mitts (37th) and Ald. Walter Burnett (27th), as well as first-term Ald. Chris Taliaferro (29th). 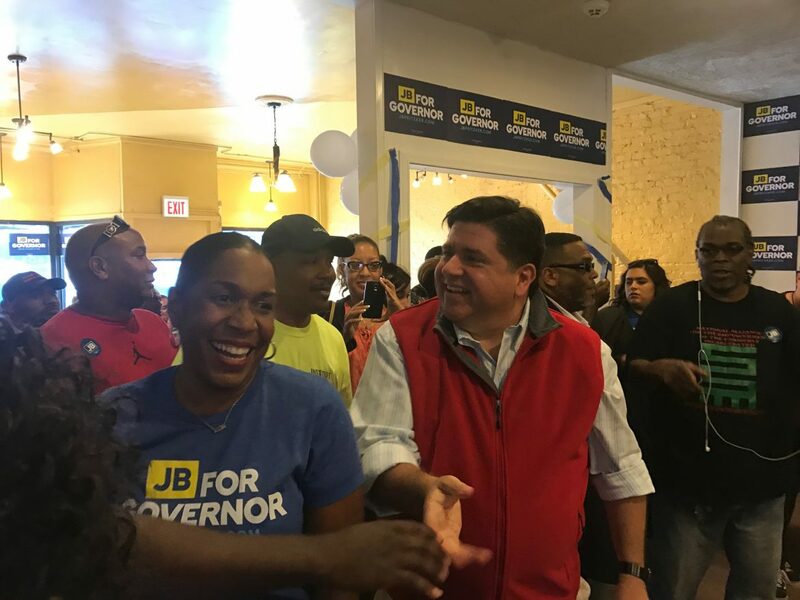 “I’m happy to be a part of the J.B. Pritzker campaign, and I didn’t hesitate,” said Mitts, who attended the Sept. 2nd campaign office unveiling. She told the crowd that during talks with each candidate, she made sure Pritzker “understands the issues not only in the 37th Ward but also on the West Side,” which she said has long been neglected when it comes to economic development, school funding and youth programs. “Now we are gonna make sure we don’t make the mistake that we made four years ago,” she said, noting Pritzker has the financial edge to defeat Rauner compared to other Democratic candidates, including Chris Kennedy. State Rep. Camille Lilly, who also listened to Pritzker’s speech at the Labor Day weekend event, said she’s still considering who to endorse and wants to hear more from the candidates. But she said she’s “very honored” about Pritzker’s understanding of “the people’s values” and his pick of Stratton as his running mate. Stratton, an attorney and new member of the Illinois General Assembly, is the first African-American woman to run on the Democratic gubernatorial ticket. Others who have yet to decide who to back include state Rep. La Shawn Ford. “It is a little too early for me to endorse a candidate,” Ford said in an e-mail, adding he’s happy Pritzker “has enough respect for the West Side voters” to open a campaign office in Austin. “The one criterion is that I want to make sure people running for governor, if they were not black, then at least they had a black running mate for lieutenant governor,” he said, citing the flourishing black leadership on Chicago’s West Side. “We gotta be very careful that we are not overwhelmed by the influence of money in the elections,” Davis said, noting that the incumbent multi-millionaire Rauner has put $50 million in his re-election campaign, while a friend of his contributing another $25 million. Cook County Commissioner Richard Boykin, who has not yet endorsed anyone, is looking for a candidate whose agenda reflects the West Side’s priorities. “I am committed to supporting the Democratic candidate with a serious and detailed plan to reduce gun violence and bring jobs to struggling communities with double digit unemployment,” he said in an e-mail interview. State Sen. Kimberly A. Lightford did not respond to interview requests. Others on the West Side still mulling whom to support include Rev. Ira Acree, pastor at Greater St. John Bible Church.